Succulents relish hot, dry situations that mimic their natural arid homes. As well as being well suited to tough conditions in the garden, succulents look good planted together in containers to decorate your outdoor entertaining areas or as gifts. They also work well planted into a vertical garden that’s mounted in a warm, sunny spot. Large succulents such as Agaves and Yuccas can be planted to create a bold statement in a large container as focal points in a garden. 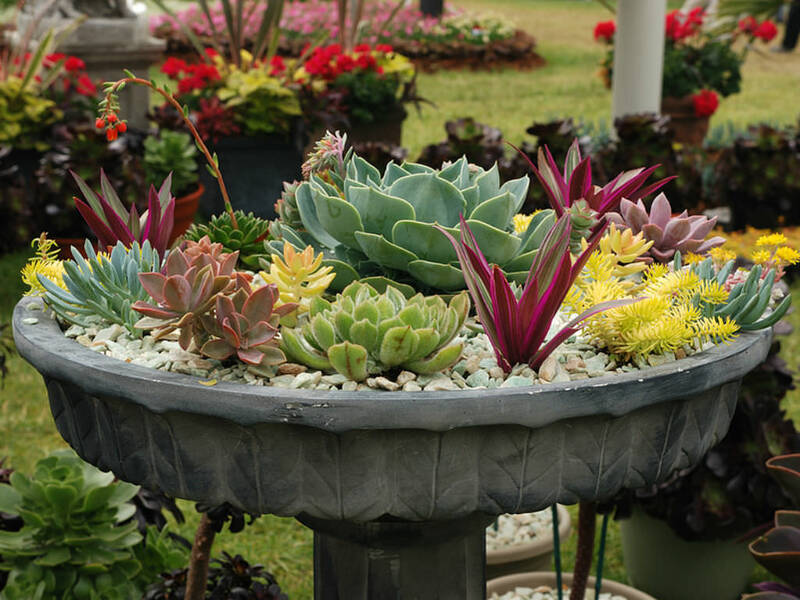 Rosette-forming succulents such as Hen and Chickens (Echeveria), Sedums and Sempervivum are well suited to containers as they are naturally compact. Also try Blue Chalk Sticks (Senecio), living stones (Lithops) and flowering succulents such as Portulaca. Small cactus can also be included in a succulent garden. For a larger container select Aeonium arboreum ‘Zwartkopf’, Jade Plants (Crassula or Portulacaria) or Flap Jack (Kalanchoe). For a garden effect arrange a collection of pots of different heights each planted with a different succulent. Agave attenuata, a Spineless Agave, is a top choice for a large container or container grouping. Where spines are not an issue, Barrel Cactus (Echinocactus) and Aloes make striking container plants. Select several plants that complement each other but offer contrast in plant shape, texture and color. To make a garden in a single container, select a broad but shallow pot with drainage holes in its base. Fill it with a cactus and succulent potting soil, then water it well. Make sure the water drains away leaving the mix moist but not wet. Place the plants in position still in their pots, arranging them to make the best effect. Once you are happy with the picture you’ve created, remove each plant from its container (water it before planting if it is dry) and plant it into its new position. Handle Prickly Cactus with tongs or a piece of cardboard or folded newspaper to avoid coming in contact with the spines. Firm the plants into the potting soil, water gently then add a layer of fine gravel as mulch. Although these plants tolerate dry conditions, they’ll establish more successfully with regular watering. Allow plants to dry out between waterings. Reduce watering in winter particularly in cold areas but resume it in spring as plants begin to grow. Inspect plants regularly removing debris such as fallen leaves or twigs. Keep plants in check by removing unwanted growth and trimming away damaged or discolored leaves. Some growers also remove flower stems to maintain the leafy effect of the planting. If a plant gets to big for its position, remove it and replace it with a smaller specimen. These plants do not require high levels of fertilizer but can be fed in once a year in spring with a slow-release plant food. In frost-prone areas place your succulent gardens in an area that’s sheltered from frost such as beside a wall or on a patio. Although they are sun loving, cactus and succulents tolerate light shade. Most succulents grow readily from leaf or stem cuttings or by separating offshoots from the parent plant. Grow cactus by separating offshoots from parent plants. Cuttings and offshoots can be struck in propagating mix, sharp sand or a good quality cactus and succulent soil.